Angkor is the most popular tourist destination in Cambodia, and one of the hottest, so you need to schedule your day to avoid both crowds and heat. Spending 3 days mingling with coach buses while sweat pours from your armpits can drain you of energy and inspiration. The key is to plan your day around early starts, shoot in the first hour or two of sunlight and then retire to the comfort of your hotel. Use the middle of the day for reviewing photos, dunking in the pool or an inexpensive massage. Then be ready at 3pm to go shoot some more. Sunset is early at Angkor, so when the light has left behind the haze and horizon you'll easily be back at the hotel in time for dinner. If you try to tackles dozens of temple ruins in the space of a few days you'll run your spirit into the ground and leave town feeling like a deshevelled ruin yourself. Go slow and give yourself time to step away from crowds and coaches in the middle of the day. * Sunset at the Bayon. Angkor Thom and the Bayon complex are a favourite for repeat visitors. Bayon reflection pools at the southern entrance are stunning around 3:30pm. Bring an ND graduated filter to balance the sky and water reflections to perfection. Climb up the top of the temple to shoot soft and warm light after 4:00pm, grand scenes filled with the ever present 'Smile of Angkor' and the crowds disappear before sun down. * Sunrise over Angkor Wat. You never know when the the cloudy tropical skies will clear for a dawn display of colour, but when it does the view towards Angkor Wat is stunning. Just before sun breaks the sky reaches it's most intense colours, but you need a tripod to shoot this properly and you need to arrive early because 200 or more other photographers will be there before sun up. The park office is open from 4am in summer and 5pm in winter to permit tourists access (and sort your permit if you didn't already get one the evening before). Don't be late. * Morning light on Ta Prohm. This is the temple that Lara Croft made famous. Tree vines are tearing down the ruins and the Cambodians are planning to 'fix it up' by removing the trees. Without this work the temple will not last another decade. Sad news for photographers, but good news for archaeologists. Nearby Preah Khan is also worth adding to the itinerary once you're done with Ta Prohm. The east entrance to Ta Prohm is lovely in the mornings. Arrive around 6:30am and have the place to yourself, plus a stellar view of Spong Trees growing tall from the temple roof. An ND Graduated filter is very useful to balance the sky high jungle and the darker lit ruins. * Remote Ruins. For hundreds of square kilometres the jungles north of Siem Reap hide ancient treasures. There is far more to see than just the temples near Angkor Wat. Of note are Beng Melea (massive stone blocks lie in scattered piles like a giant lego set), Kbal Spean (carvings placed in the waterfalls and river beds inculcate the passing water with spiritual powers) and Banteay Srey (detailed Hindu motifs carved into pink hues of sandstone). If you have another morning free then the Rolous Group of temples are fascinating too, but start with the elegant Bakong before the tourist buses arrive. * Markets. Siem Reap has a massive fresh market a few kilometres away from downtown, locally known as Psar Leu. It's fabulous, frantic and full of photo opportunities. Asian produce and the Khmer people make it one of the best in South-East Asia. Ice cold lime shakes and freshly opened coconuts can help beat the heat outdoors. Stay around the edges of the market where there is light and life. * Floating Forest at Kompong Phluk. South of Siem Reap is the Tonle Sap, a massive water body that floods in the wet season to ten times it low volume. October and November are good months to avoid the rains but enjoy the flooded lake. Villages on stilts can be toured by boat for a modest cost while offering immense cultural curiosity. Switch to little canoes for a guided paddle through the Flooded Forest where the high water level almost reaches the tree tops and you get a unique view of the ecosystem. * 1000 Buddhas. In an effort to protect the remaining treasures of Khmer culture many carvings are being removed from temple ruins and put on display in the Angkor National Museum. Replicas of those relocated pieces are left on the temple site. The collection is impressive and air conditioned. The more you understand about the historical context of the temples the better prepared you will be to photograph them later. * FCC. Not so much a big deal for shooting but easily my favourite menu in town. Divine Khmer taste platters, French a la carte and sassy cocktails. Downstairs is the impressive collection of photographs by John McDermott. He hasn't produced many new perspectives on Angkor since 2001 (he was too busy running the gallery) but his work is the gold standard for Siem Reap. You wont get a better souvenir of the temples, other then the ones you shoot yourself of course. John also runs a few workshops on occasions to share his skill. In early November the light is often good, with clear skies most afternoons and a reasonable chance to get clear skies in the mornings. Sunrise at Angkor Wat is the iconic shot you'll want to make all your friends back home drool and gawk. In fact the major problem with a great Angkor shot is the vivid colours are sometime so intense that folks back home wont believe they are real. Well before the sun comes up the colours of the sky reflect off the water pools and the shutters go crazy. October to December are the peak times to shoot Angkor sunrises, because the wet season leaves behind a little more water for photographers to play with. The sun comes up early, really early. 5:30am in October, 5:45am in November, 6:05am in December. Effectively you need to leave your hotel before 4:30am to leave time to clear the ticket check, drive to Angkor and walk through to the inner reflection pools. That alone can take 15 minutes in the dark. I want to be shooting 30 minutes before sunrise. Remember that the scene turns crowded early so you need to count on get there early and standing around for a while (with a few thousand mosquitoes to keep you company). And that assumes the light does warm up. Afternoon light is altogether different, consistent and brilliant. By 4:30pm each day the sun is low and rich with golden tones, my favourite light. The air is cooler too, gratefully so. Plan to be where you want to be by 3:30pm. By 5:30pm the sun has set and by 6pm the light is gone. The light around 5:15am is just enough for 30 second exposures on slow speed film. In these situations high ISO speeds are not enough to overcome the low light. Low ISO and slow exposures yield better images, with superior tones, no noise and lovely definition. You need a tripod. In town there are lots of digital photo shops that also sell cheap tripods ($25 to $35). If you're not a fan of carrying tripods on your travels perhaps it's worth buying one on arrival then donating it to a charity when you leave. If you have never used a tripod before the restrictive movement can be annoying. Remember, sunrise at Angkor is really about one shot only, so set and prepare yourself for it. A good place to start is aperture priority, F13, and try adjusting the exposure compensation to under expose half or a full stop to see if you can get richer colour saturations. As the sun gets closer to rising the light is too bright to sustain the rich hues. Be early. One piece of equipment you'll need every day is a lens cloth. Not so much for dust but for steam. Hotels and vehicles are air-conditioned like the Arctic, so your camera collects condensation like an ice block. If you can keep your gear out of the air-conditioner you'll be better off. But a good cleaning cloth is essential. I have visited the temples of Angkor many times and always with the advantage of a nice wide-angle lens. You need 24mm of lens to get into the game, and 16mm is often useful too. That means buying a 10-20mm lens if you're shooting with a partial-frame DSLR (APS-C format) or a 16-35mm for a full-frame model. A few years back I invested in a 24mm primes lens, with super straight perspective and wide aperture shooting. That's now my favourite lens for Angkor too. Two options are available for shooting the Angkor complex from the air. A tethered balloon ride descends and ascends once every 20 minutes and costs just $15, but the location of the balloon is too far back from Angkor to expect quality shots of any detail. The height of the balloon is insufficient to get a good overview of the complex too. The better option are helicopter rides that run on request. Air traffic is restricted around Angkor so you won't be buzzing close over the inner sanctuary, but you do get a good wide view of the entire complex. Only from this perspective can you fully appreciate the scale and architecture of Angkor Wat. The standard 14 minute flight continues past Angkor Wat towards Pre Rup and a little beyond. Close to Angkor Wat the helicopters have to maintain an altitude above 1500ft, but they drop down to 500ft after that. You get some good shots of farms and temples when the light is good and when you have an open window or door. And that's a bit of a glitch. I booked a request for myself and two other photographers to ride an R44 helicopter with the doors off. This machine has 4 seats including the pilot, and with the doors off you all get clear access to shot in clear air. When we arrived we had a larger helicopter with 7 seats and one retractable door. The result was less than ideal for everyone except the one lucky person with the open door. Up in the front seat I had a window to shoot through, about the size of an A5 sheet of paper. Again, not exactly a dream come true and far from what we had arranged. If you take to the air around Angkor, take low expectations and enjoy the ride. But take the chopper, as the $15 balloon option is barely worth the money. Passes for the park come in 1, 3 and 7 day validity. The 7 day can be use for any 7 days in a month, while the 3 day pass is for consecutive days only. You have to show the pass on every trip north of Siem Reap, but the process is very efficient. 3 days currently costs $40. Getting around the temples is often best done by hiring a Tuk Tuk driver. $8 for a half day or $15 for the whole day, but be sure to tip them something extra. Air-conditioned cars are around $30 a day but your lenses fog up the moment you get out of the vehicle. Tuk Tuks are open to the elements but the breeze keeps you cool without steaming up your kit plus you get to shoot passing traffic. Visas are issued on arrival as a matter of course. Have your Passport photo handy, fill in the application form and hand over a $20 note. US Dollars are the defacto currency, with the Cambodian Riel used only for small change. 1 dollar is worth 4000 Reil. 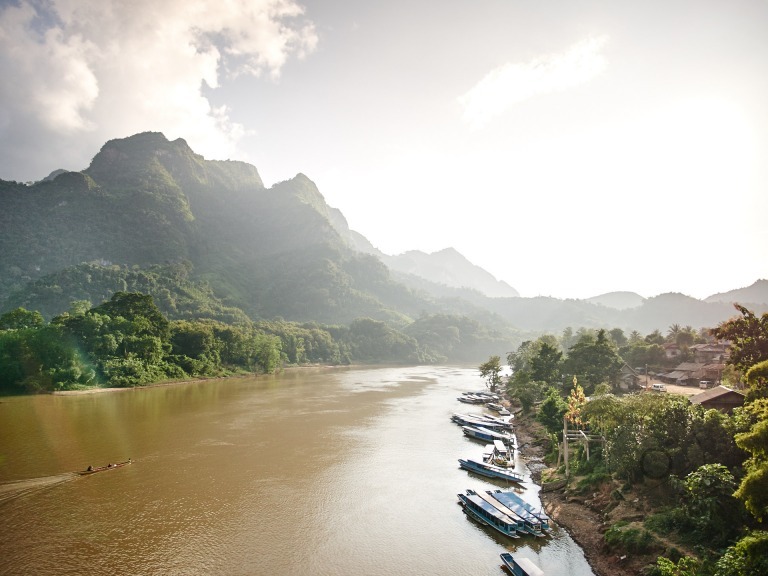 Direct flights connect Siem Reap with KL, Bangkok, Singapore, Hanoi, Beijing and cities in Laos - just to name a few. Accommodation is rampant around Siem Reap but try to pick something with a short walk of the downtown, and something with a pool. Cambodia is hot enough to melt your brain. Quick access to a cooling swim and the ice-cream at Blue Pumpkin are essential to survive the afternoon heat. Good dining options can be a little patchy in Siem Reap. The FCC is singularly fabulous for local cuisine, French fusion and crafty cocktails, Cheaper menus and yummy meals are always available in the old part of town however - try Khmer Kitchen for really good Khmer style at affordable prices, and the Soup Dragon has a stellar array of regional cuisine if you want a touch of Vietnamese or Thai instead of Khmer.